Watch enough football, I suppose, and you end up seeing the same players again and again. This is certainly true within the relatively small gene pool that is Scottish Football, but browsing through my programme for this encounter between York City and Oxford United (I shall not bore you with details of how I found myself in that fascinating city), I saw a very familiar name: Peter Duffield. 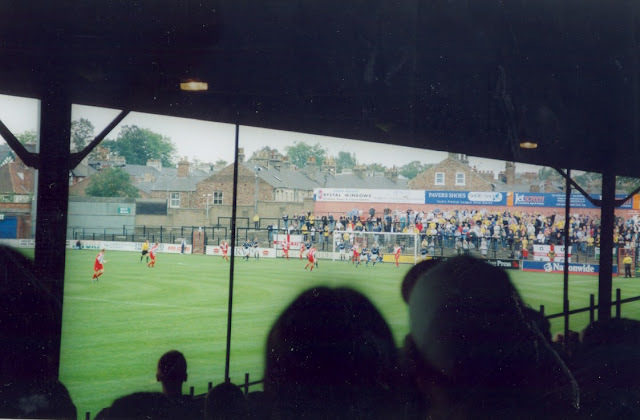 I had seen him play a couple of times for Hamilton Accies, and even during the lifetime of this blog I had witnessed him turn out for Morton at Falkirk. Duffield had enjoyed a fruitful two years at Hamilton, before being transferred to Airdrieonians where had rather less fun. The law of diminishing returns hit in during subsequent equally unhappy periods at Raith Rovers, Morton and Falkirk before he dropped off my particular radar. 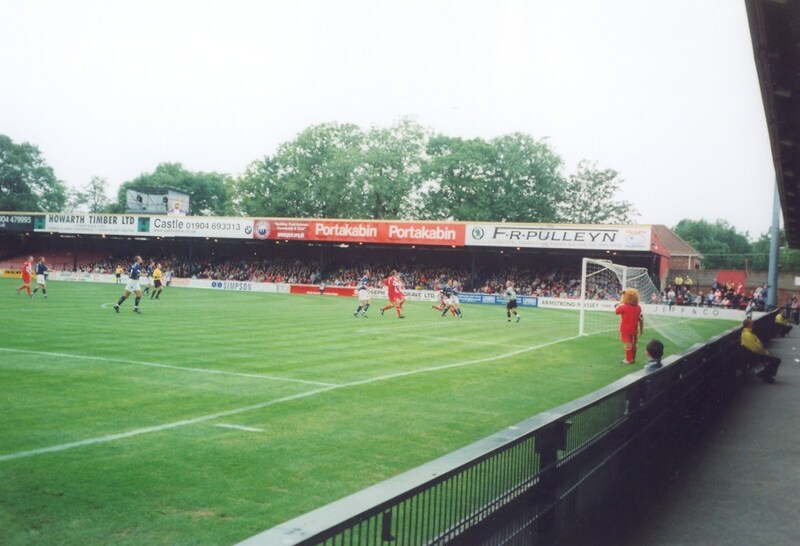 And here he was, large as life and just as good-looking, a few years later in York City colours. That one of the tabloid newspaper reports of the match headlined with “Duffer Duffield” maybe gives the reader a clue as to how he fared in this match. Not one of his vintage displays, he rounded it all off perfectly by missing a first-half penalty. He and his team-mates were made to rue that miss when, in the 61st minute, Oxford’s Gavin GORDON headed in a pin-point cross from Matt Robinson, presenting York with their first home defeat of the season. 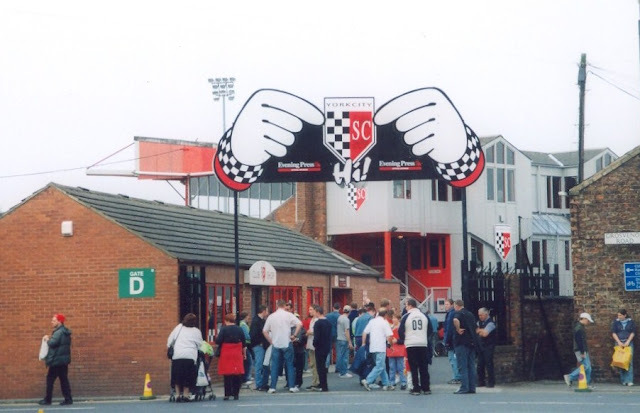 What a great entrance to a football ground! 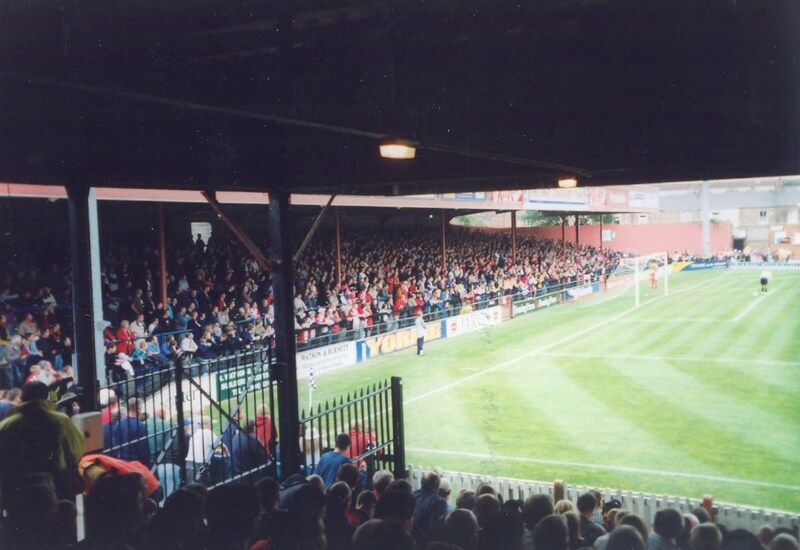 Panorama of Bootham Crescent, York.